Consumers today engage with brands in multiple ways through multiple channels both online and offline. In this new world of omni-channel marketing, print remains a dominant force. Print and digital communications are complementary features of an effective marketing campaign. Personalized printing such as direct mail receives a better return on investment as the message is tailored to a specific audience’s known tastes and needs. Retail signs imprinted with QR codes and AR digital information link the customers back to a brand’s websites, videos and social media sites and create a virtual shopping experience that guides the consumer through the buyer journey. Convergence of offline and online strategy includes integrated marketing campaigns with social media links on printed collateral that send customers online and vice versa. In-store signage that changes frequently to keep up with consumers’ short attention spans and need for ever changing information and graphics. Print and technology together will continue to connect the online and offline shopping experience and create opportunities for Print Service Providers. 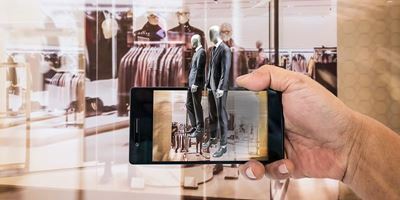 Kodak offers media to create a multitude of applications to help retailers meet these new challenges.